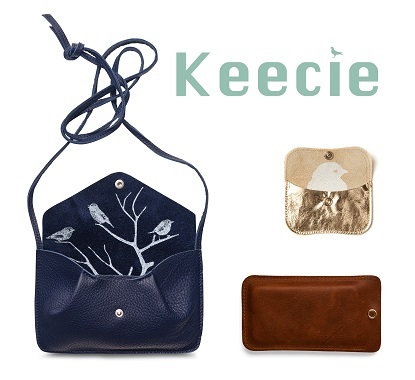 Today’s giveaway is from a swooworthy Amsterdam based handmade leather goods brand, Keecie. All their stunning designs are made from real leather, which means that your new bag, a sassy wallet, a sweet clutch or a cool little case will get more and more beautiful with years to come. Their snazzy collection will surprise you with their unique take on shape, original print and fun colours to choose from. If you are lucky to own one of their beauties, I promise it will become your go-to bag that will serve you well, add a bit of sass to your everyday outfits and it will be your reliable companion for years to come. Today, Klaartje, the sweet owner is offering one lucky person a chance to win not 1 but 3 of their amazing pieces. Yup, the winner will get a 3 piece set of: this Backing Vocals purse in ink blue colour, this Listen up, iPhone 5 sleeve in cognac colour and this Mini Me wallet in gold colour. Total value of over $140 (or 104.50 Euros)! How awesome is that? I am incredibly smitten with all their pieces. Psst: and I totally hinted to Balazs that this bag would be very welcome under the Christmas tree this year:) Giggle! Update: The winner is Marieken. I love the big business bag. Thanks for the giveaway! Hi! My favourite item is the shopping bag in blue. I want to win! Crossing my fingers. Thank you! I love the elephant joke bag as well, so cute!! I like keecie on facebook. Thank you! Hi! I follow express-o on facebook. Thank you! the usb holder would be great for work! also follow you on fb. thanks! This is a lovely shop. I like the flora & fauna bag in red. Thanks for an amazing giveaway! I follow your blog via bloglovin - E. Samples. That shop is all that is cute! I love http://www.keecie.nl/en/webshop/productid/49/colorid/765#.UpOLmo3SagM : Room Service, in yellow! I love the room service bag in grey brown. Awesome! I adore the window shopper bag!! I follow Keecie on twitter now too! LOVE her shop!!! What a great giveaway! I love the Fauna & Flora in ocean blue but any would do. My email is carmendepascual@gmail.com. I am in love with Hungry Harry bag. 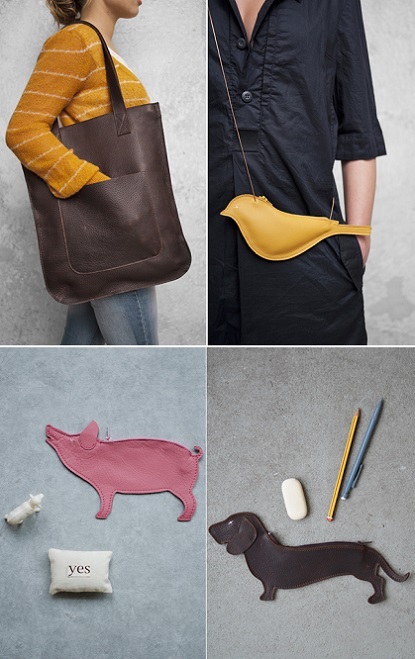 that bird bag is super quirky and so fun, i'd choose that i think!! This is a great great give away! love it! and the inside detailing adds so much! I'm in LOVE with the Flora & Fauna bag! Hi Diana!!! I´m the winner of the necklace giveaway!!!! !I´m happy!!!! I love the Hungry Harry bag! I love the cat chase clutch! I love the Cat Chase bag. ... and I follow you on Pinterest. joined the FB group and followed keecie on FB too! Great giveaway! I love the tweet bird! I think the Flora and Fauna Bag in the Moss Used color is to die for! Fantastic shop and giveaway, thank you!!! I follow via email and I adore the Picking Flowers, medium in red!!! I'm also a follower of express-o on pinterest! I love the Elephant Joke, great bag!!! one fave piece is - the big brown leather bag in the above pic . My favorite item is the Cat Chase Bag! I followed you via bloglovin and my favorite item is the Head Office bag. I liked Keecie on Facebook. I joined exPress-o group on Facebook. Good Dog, Bag for it's novelty and Hungry Harry because I'd wear that everywhere!